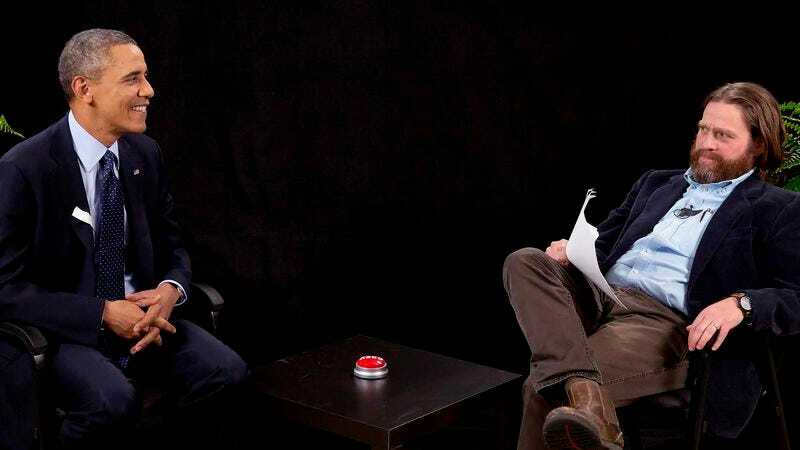 Instantly vaulting the show to the level of such political arenas as Meet The Press and Rowan And Martin’s Laugh-In, President Barack Obama appeared on Zach Galifianakis’ Between Two Ferns. (Though, as his detractors will no doubt point out, Obama clearly hewed to the far left fern.) The official reason was to plug HealthCare.gov to the kids, but that was just an excuse for a typically faux-contentious debate between host and president, with each side getting in a few good digs. “How does it feel to be the last black president?” Galifianakis asks. “If I ran a third time, it’d sort of be like doing a third Hangover movie. Didn’t really work out very well, did it?” Obama counters. And so on, with the sort of sick-burn repartee that Frost only wished he could have had with Nixon. Anyway, the whole thing is worth watching, if only so you’re up on what the comment sections on the most sunless sections of the Internet will be complaining about today. But whether you find this a hilarious lark, or a complete desecration of the Constitution, from a strictly pop-culture standpoint, you have to give credit to Obama. His is easily the best performance by a president on an Internet series, unless you count George W. Bush’s years of playing “Reggie Watts” on Comedy Bang! Bang!